Includes a 16 page booklet with Hawaiian lyrics, English translations, liner notes & cultural information along with the popular version of the hit single "Hawaii '78". 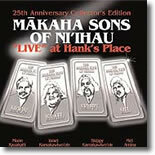 In 1978 this fourth album was recorded live at Hank's Place, the popular restaurant/nightclub where they performed nightly with their special brand of Hawaiian music. "Live" features the original foursome performing at their best.